LANDOVER, Md. 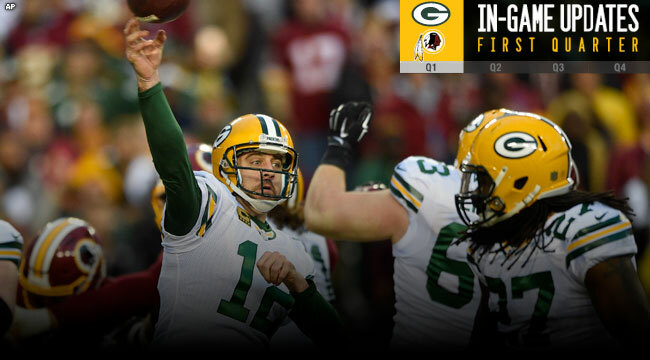 — The Packers trailed the Redskins, 5-0, heading into the second quarter of Sunday’s wild-card playoff game at FedEx Field. The Packers won the toss and elected to receive. The two teams exchanged punts and the Packers were left to begin their second possession at their 8-yard line. On third-and-13, Aaron Rodgers was sacked for a safety by Preston Smith. Smith beat JC Tretter, who started at left tackle in place of the de-activated David Bakhtiari. Tim Masthay’s free kick was returned to the Redskins 45-yard line. On the next play, Kirk Cousins threw to Alex Smith for 16 yards to the Packers 39. Alfred Morris gained 5 to the 34, and the Redskins were in field goal range. A Cousins pass to Jordan Reed gained 11 yards to the Packers 15. The Redskins nearly scored on the next play, a 14-yard pass from Cousins to DeSean Jackson, who beat Damarious Randall on a drag route. The Packers stopped Morris on two thrusts and the Redskins were guilty of delay of game on third down, moving the ball back to the 7. Cousins’ pass for Pierre Garcon was incomplete, and the Redskins had to settle for a field goal, 5-0, with 4:51 to play in the first quarter. Washington had the ball at the Packers’ 37 when the first quarter ended.